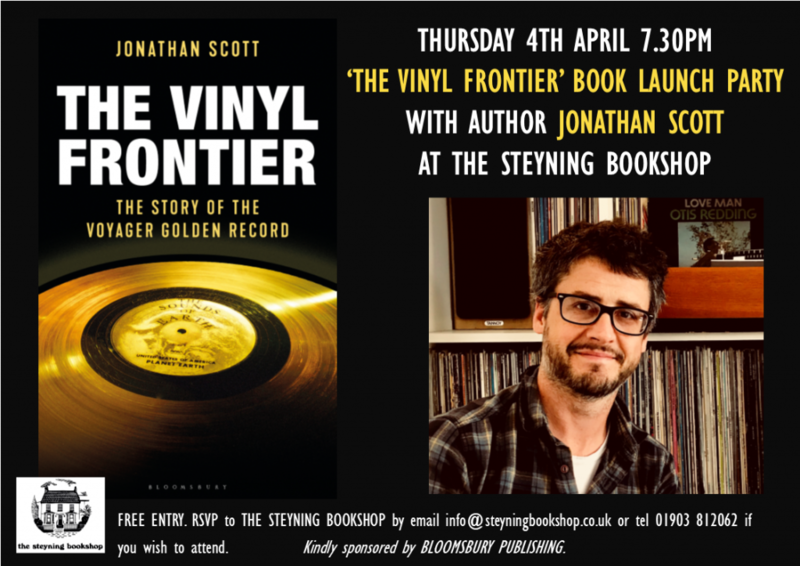 We are very excited to be hosting a launch party for local writer Jonathan Scott’s new book ‘The Vinyl Frontier’, which tells the fascinating story of the Golden Record – an inter-stellar mix-tape sent into space with the Voyager Missions in 1977. Curated by Carl Sagan, the 90 minute disc contained music by JS Bach and Chuck Berry, ethnographic field recordings, and a message of peace by President Jimmy Carter – a field guide to Earthlings for the Cosmos. ‘The Vinyl Frontier’ follows the project from first phone call to final launch, and it is a truly fascinating story of an optimistic project with a cosmic vision of peace and unity. Jonathan Scott has been fascinated by the Voyager Golden Record project ever since he first heard of it, and the book grew out of a magazine article on the subject that he penned for Record Collector Magazine. Formerly a contributing editor to Record Collector magazine, Jonathan has edited books about Prince, Cher and the San Francisco psych explosion, and written about Nirvana, the Pogues, the Venga Boys, Sir Patrick Moore and Sir Isaac Newton in a variety of magazines. He is a self-confessed astronomy geek who received his first telescope at the age of eight! The launch party will start at 7.30pm with wine kindly provided by Bloomsbury Publishing, there will be delicious home-made canapes to nibble, and Jonathan will share a few stories from his research before signing copies of his book.